Guests in the Fifth Avenue Garden for the Frick Collection’s annual Spring Garden Party. 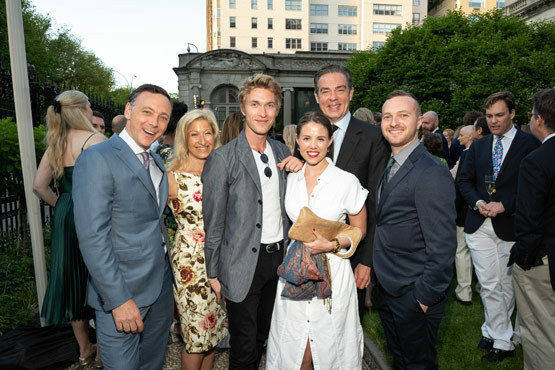 Last Wednesday, May 30th, the Frick Collection hosted its annual Spring Garden Party for Fellows at the museum’s historic Fifth Avenue Garden. The Collection’s permanent collection galleries were also open for the evening as well as the rarely seen second floor of the former Frick Mansion. Also on view was the Frick’s newly opening special exhibition Canova’s George Washington. The show examines the history of Antonio Canova’s lost masterpiece, a full-length statue of our nation’s first president, which was unveiled in 1821. The first and only work by the artist created for America, the exhibition brings together Canova’s full-sized preparatory plaster model (which has never left Italy), and related sketches, engraving and drawings. This is literally a “Garden Party” where guests meet outdoors on the terrace and the lawn of the mansion overlooking Fifth Avenue and Central Park. Cocktails, wine, beer and a tempting variety of seasonally inspired hors d’oeuvres and desserts were served in the garden, accompanied by the music of the noted jazz quartet The Flail. Also inside the house, guests enjoyed dancing to DJ’d selections in the Music Room all night long. Genevieve and John Allen, Isha Ambani, Paul Arnhold and Wes Gordon, Eiko and Michael Assael, Charles W. Banta, Beverly Bartow and Jim Stengel, Frances Beatty and Allen Adler, Mr. and Mrs. Jason Ruggles Bernhard, Peter and Sofia Blanchard, Francesca Bodini, Elizabeth and Ralph Brown, Edward Lee Cave, Jason Chandra, Stephanie Andrica Ciccone, Margaret Civetta, Missey Condie, Catherine A. Corman, Jerry Ann Woodfin Costa and Victor Costa, Barbara Dau and Barton English, Michael M. Espiritu, M.D., Bruce and Carol Factor, Barbara G. Fleischman, Sarah Flint, Julia Flynn, Delia Folk, Pamela and David B. Ford, Joanne duPont Foster, Marina Kellen French, Lee and Sergio Galvis, Stephen A. Geiger, Lady Gibbons, Henry P. Godfrey, Hubert and Mireille Goldschmidt, Elizabeth Grammaticas, Lucy Green, Agnes Gund, George A. Hambrecht and Andrea Henderson Fahnestock, Kevin J. Hanratty, Mr. and Mrs. Michael J. Horvitz, Roberta and Richard Huber, Melissa Jacobs, Jane and Charles Klein, Nell and Robert Kleinschmidt, Patricia Klingenstein, Casey Kohlberg, Christine Kuan, Elizabeth Kurpis, Lucy Jane Lang and Scott Asher, Alexia and David Leuschen, Marc A. Lewinstein, Wendy and Julian Lewison, James C. Marlas and Marie Nugent- Head Marlas, Frances Marzio Harry M. Mateer III and Jessica A. Mateer, Amory and Sean McAndrew, Caroline A. McCarthy, Monika McLennan, Roberto and Allison Mignone, Hilda and Arnold Neis, Mr. and Mrs. William A. Nitze, Francis Q. O’Neill and Dorothee Volpini de Maestri, Gregory and Susie Palm, Jessica Patcella, Laura Pels, Winifred and Ivan Phillips, Caitlyn Pickens, Alexandra Porter, Bryan and Megan Ramm, Katherine J. Rayner, Dr. and Mrs. James S. Reibel, Katherine G. Reibel, Barbara A. Reuter and William J. Williams, Jr., Mary Madeline Roberts, Sana H. Sabbagh, Justin M. Sanders and Elizabeth Lyons, Danielle Sapse, Dr. and Mrs. Stephen K. Scher, Michael Schiller, Charles N.W. Schlangen, Stephen and Christine Schwarzman, Mr. and Mrs. Stanley DeForest Scott, Bernard Selz, Lacary Sharpe, Gillian Steel, Sarah Stengel, Aso O. Tavitian, Sara Tecchia, David and Julie Tobey, Rebecca Vanyo, Patricia Vitanza, Brahm Wachter, Andrea Woodner, and Ashley Wyndham.